Doctors say they have been left stressed and in limbo, and potentially out of pocket over plans to move home. The Royal College of Physicians, which oversees recruitment, apologised for the "human error" and is working over the weekend to restart the process. 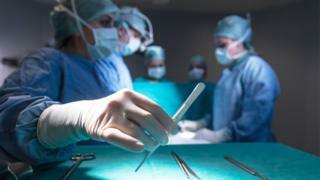 Doctors' union, the British Medical Association, said it was "appalled". The junior doctors were alerted to the error just before 17:00 BST on Friday, at the start of the bank holiday weekend. Fellow doctors described juniors as being in tears. Many were set to uproot their families to take up the job offers, selling homes, putting offers down on houses, moving children to new schools and partners resigning from jobs to find new ones. Image caption Rupert Simpson was delighted to be offered a job in London - "I thought everything was perfect for us"
Rupert Simpson, 29, said he was in "total limbo" after the withdrawal of his job offer to work in cardiology in London. "I'm getting married next month, and my fiancée lives and works in London - it would be very difficult for us if I don't receive another offer in London," he said. "For years I've been moving from contract to contract as a junior doctor, so the idea of having a stable job for five years was amazing. "It's hugely annoying and upsetting to have the carpet swept out from under us after someone made a spreadsheet error." A nationally co-ordinated system, known as ST3 Recruitment, is used for recruiting doctors across England, Scotland and Wales into a broad range of specialities. Last month, after attending interviews, up to 1,500 junior doctors entering their third year of specialist training received job offers in 24 different medical fields. Each candidate was given a score which determined how likely they were to get their choice of hospital and specialty. On Thursday, the Royal College of Physicians (RCP) discovered a significant number of candidates were credited with the wrong score, because of an error transferring data from one computer programme to another - and may therefore have received an incorrect job offer. On Friday, the RCP wrote to all those who had offers to say it was being rescinded. "We are deeply sorry that it has been necessary to rerun the ST3 offer process due to a mistake in this round of processing," the letter from the RCP said. "We have taken this approach to be fair to all candidates which can only be achieved with the real scores used." In an updated statement, the RCP said it was working through the weekend to restart the recruitment process but it will take more than a week until the first offers start on Monday 14 May. It acknowledged the "bad timing" of the announcement but said "we decided that it would be even worse to keep the information to ourselves for three days" and wanted to be "as transparent as early as possible". I was offered my first choice training job in infectious diseases and microbiology, and as a result have taken out a loan to carry out work on my house, knowing I would not have to move home and having job security for five years. As well as this, I have turned down job offers for other positions. I am now in a much worse position than I was a month ago. I have also had to arrange childcare for my eight-month-old daughter in a suitable location. My wife is going back to work after maternity leave in August as well and is yet to know what hours she will be working. Needless to say stress levels in our household are very high. The timing couldn't have been worse as we were told the news on Friday afternoon before a bank holiday weekend. Speaking on behalf of the junior doctors, the BMA issued a statement saying: "We cannot express how unacceptable we find this situation." It said it had caused extreme anxiety for trainees and lamented "the impact - both emotionally and financially - it is having on junior doctors across the UK". Chairs Chaand Nagpaul and Jeeves Wijesuriya said they had spoken at length with Professor Jane Dacre, president of the Royal College of Physicians, "to articulate the strength of feeling". "We have heard from trainees who have, after receiving these job offers, put down deposits on homes, arranged moves or whose families had adjusted their plans," they said. "We have conveyed our expectation that college will support and compensate these trainees for any inconvenience." The BMA said it would take legal advice regarding a possible breach of contract, and compensation. James Savage, 28, ended talks with other potential employers when he received his first choice job offer in renal medicine in the West Midlands. "It's not well understood how much we move around as junior doctors. "You move jobs every four months, hospitals and even locations every year. So these contracts were an offer of stability for the first time. "Our morale is already extremely low. This isn't going to help things." Liver doctor Ben Hudson said juniors were "in tears" while the RCP was "carelessly playing with people's futures". @iidabee tweeted to say she and her junior doctor spouse had been viewing houses that week thinking they would "finally get some stability in our lives". The RCP said the error was discovered on Thursday and the college had worked as quickly as they could to identify the nature and extent of the problem. "We appreciate what a worrying time this is for you and will provide as much information as we can, when we can, so you know what is happening," the RCP stated in a letter sent out on Friday. The RCP added that those doctors who had accepted offers - and made significant plans and commitments based on those offers - would be treated on a case-by-case basis. "We set the highest standards for our work and expect to be held to them. We have not met them here and are truly sorry," it said. "We will learn from our mistake and make any changes necessary to fix it." The Department of Health said it was monitoring the matter closely and was satisfied there would be no impact on patient safety as the jobs were not due to begin until August.